This set of Linear Integrated Circuit Assessment Questions and Answers focuses on “Slew Rate – 2”. Therefore the higher current should be given a small compensating capacitor is used internally or outside an op-amp. 2. Find the expression for full power response. where fmax is called as full power response. 3. Calculate the time taken by the output to swing from +14v to -14v for a 741C op-amp having a slew rate of 0.5V/µs? => Time taken = 14-(-14)/ 0.5V/µs = 28v/0.5V/µs = 56µs. 4. Consider a square wave having a peak to peak amplitude of 275mv and it is amplified to a peak to peak amplitude of 4v, with rise time of 5.2µs. Calculate the slew rate? Therefore, slew rate = 3.2v/5.2µs =0.615v/µs. 5. Determine the maximum input signal to be applied to an op-amp to get distortion free output. If the op-amp used is an inverting amplifier with a gain of 50 and maximum output amplitude obtained is 4.2V sine wave? ∴ the output voltage = 4.2+4.2 =8.4 V peak to peak. Hence for the output to be undistorted sine wave, the maximum input signal should be less than => 8.4/50= 0.168 = 168mVpeak to peak. 6. What happens if the frequency or amplitude of the input signal is increased to exceed slew rate of the op-amp? Explanation: Slew rate determines the maximum frequency of operation for a desired output swing. If the slew rate is greater than 2πfVm /106 then the output is distorted, whereas an increase in the frequency /amplitude of input signal distort the output. 7. Compute the peak output amplitude, when the voltage gain verses frequency curve of 741C is flat upto 25Hz. Vo = 30 Vpp ; Slew rate = 0.6v/µs. => 30v/(0.6v/µs) =50µs. Hence the maximize input frequency fmax at which the output get distorted is fmax = 1/(2×50µs) =10000 =10kHz. 9. Match AC parameter of the op-amp in column 1 with the column 2. Explanation: Analysis of difference between three AC parameter; bandwidth, transient response and slew rate. 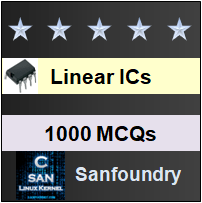 To practice all areas of Linear Integrated Circuit Assessment Questions, here is complete set of 1000+ Multiple Choice Questions and Answers.